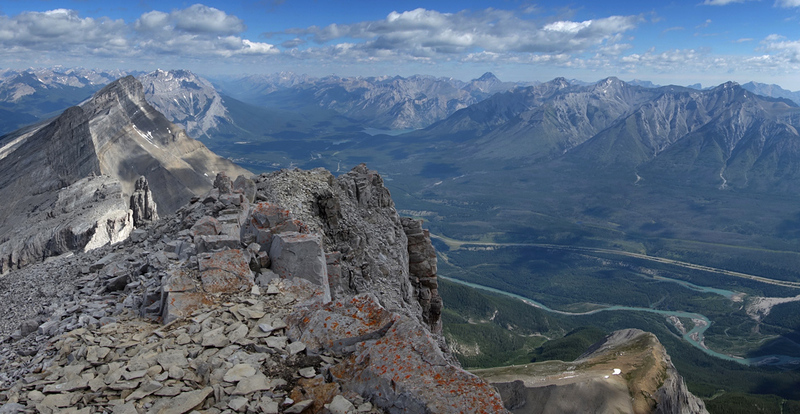 Above: A very long traverse awaits between the East End of Rundle and its true summit. 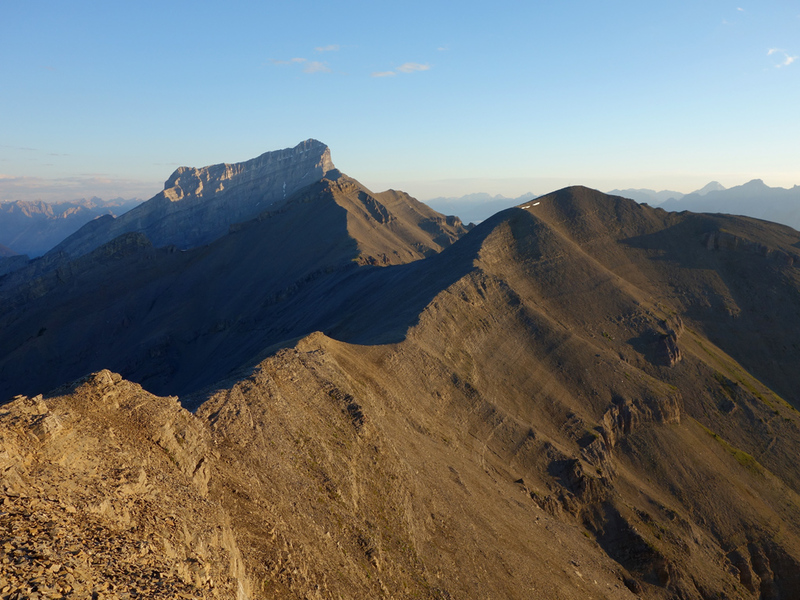 EEOR is an easy scramble, the traverse involves some difficult and exposed downclimbing, and the main summit is a challenging climber's scramble / free-solo that shouldn't be underestimated. 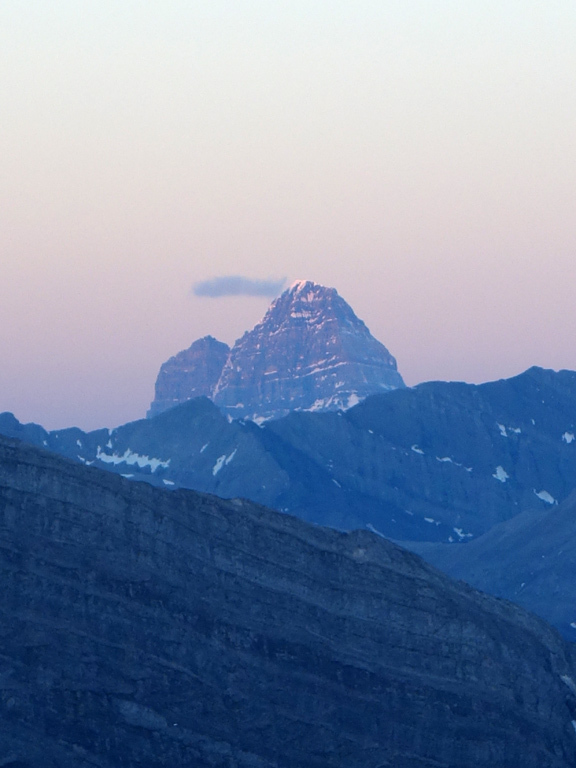 I've read that Mt. 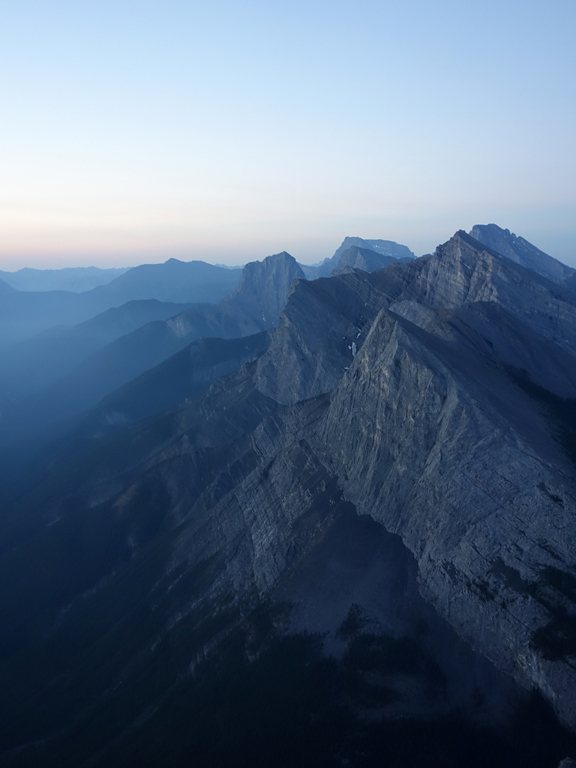 Rundle is the most photographed mountain in the Canadian Rockies and it's easy to understand why. 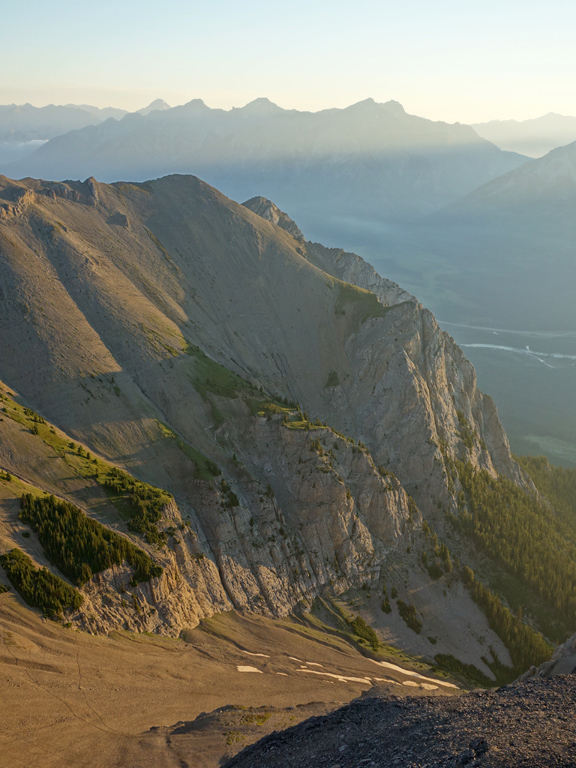 Serving as the perfect postcard backdrop to the town of Banff, and physically linking that town to Canmore, it's an impossible mountain not to notice. 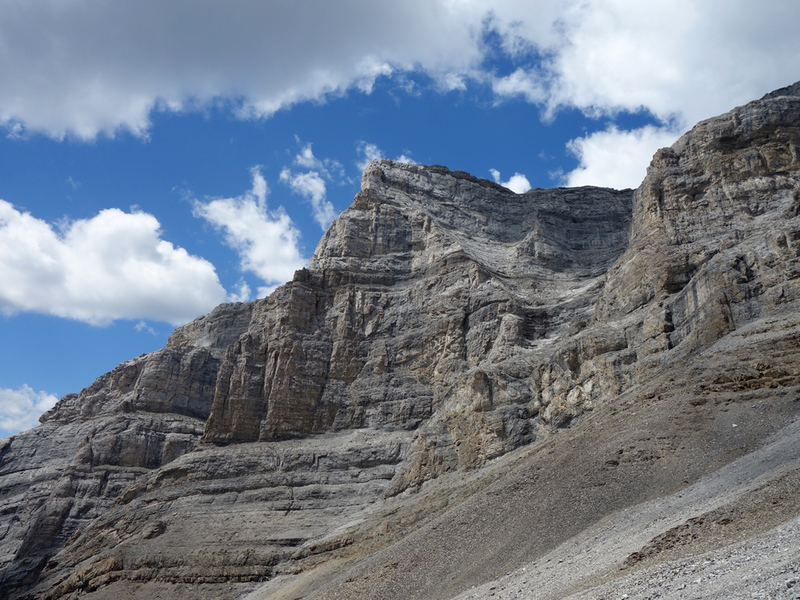 However, what few may know is how amazing this mountain looks up close when traversed from the east. 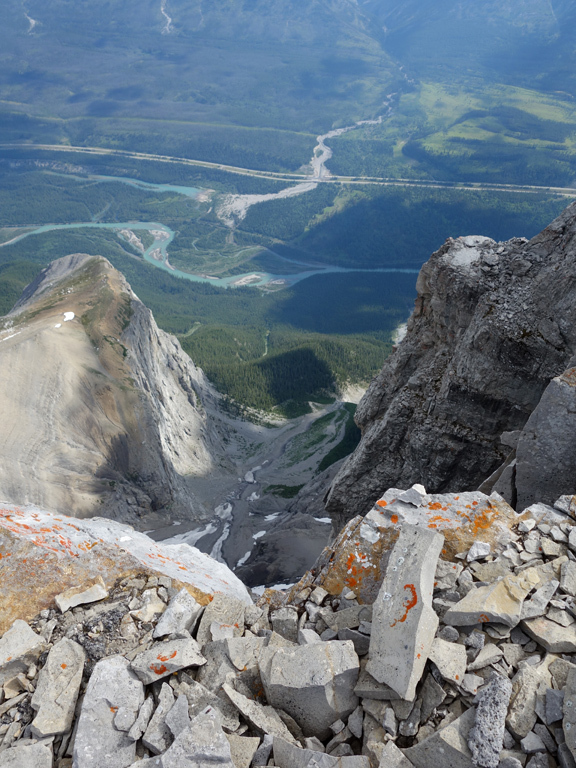 Starting from Whiteman's Pond, a climb of the East End of Rundle (EEOR) provides much better views of the Canmore/Spray Lakes region than nearby Ha-Ling or Lawrence Grassi, but it'll be the rest of Rundle that will steal the show. 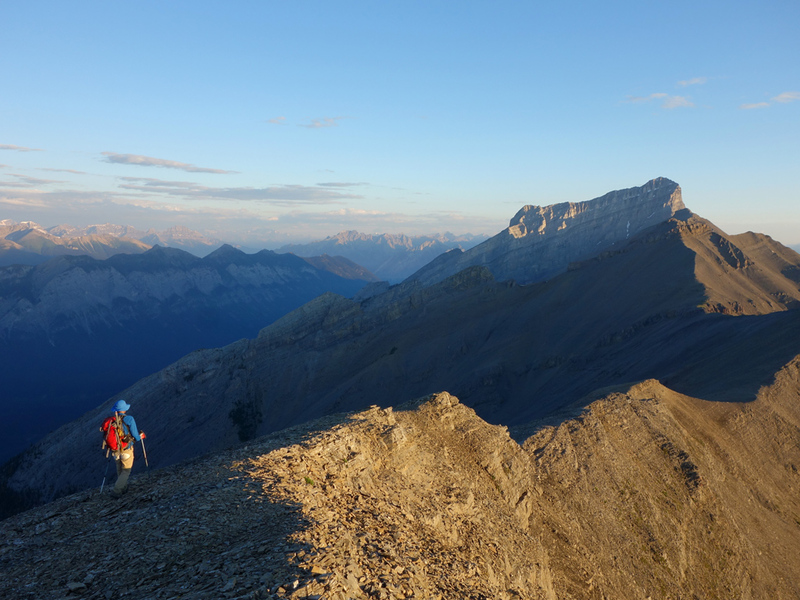 Like crossing a cathedral roof, the ridgewalk traverse brings you past one awesome looking spire-crowned flying buttress after another, each with impossibly steep faces and the lush Bow River valley as a backdrop. 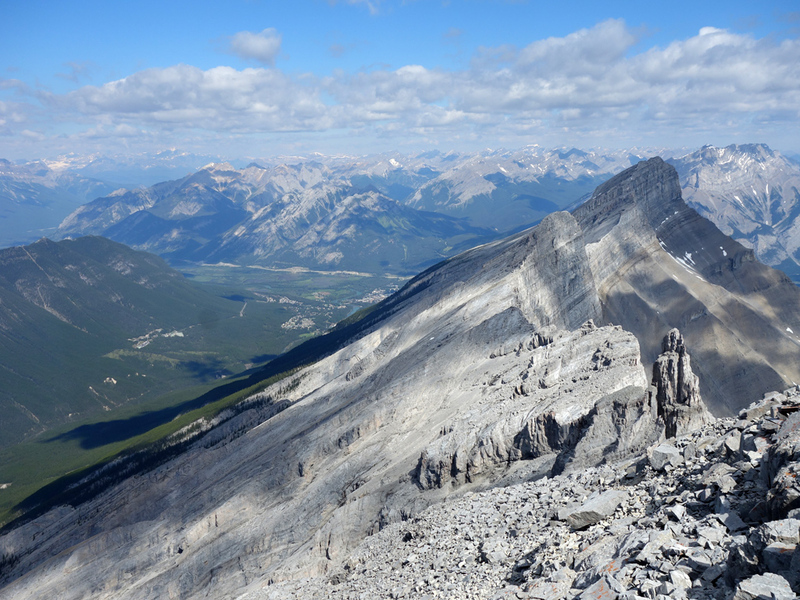 Waiting at the end is the awesome southeast face of Rundle's summit block, which looks unremarkable for most of the traverse until you're close enough to appreciate the incredible details and sheer scale of its sculpted limestone. 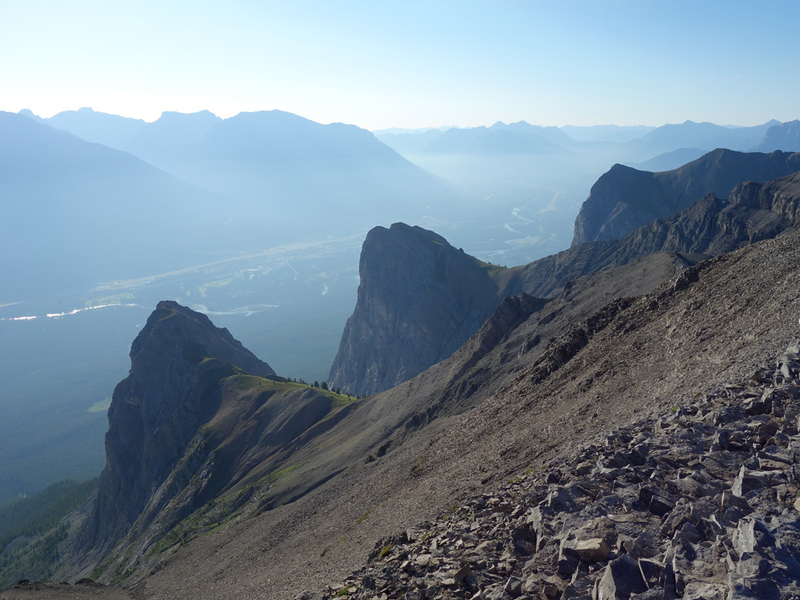 Take careful note that I'm very hesitant to give this trip the “scrambling” label. 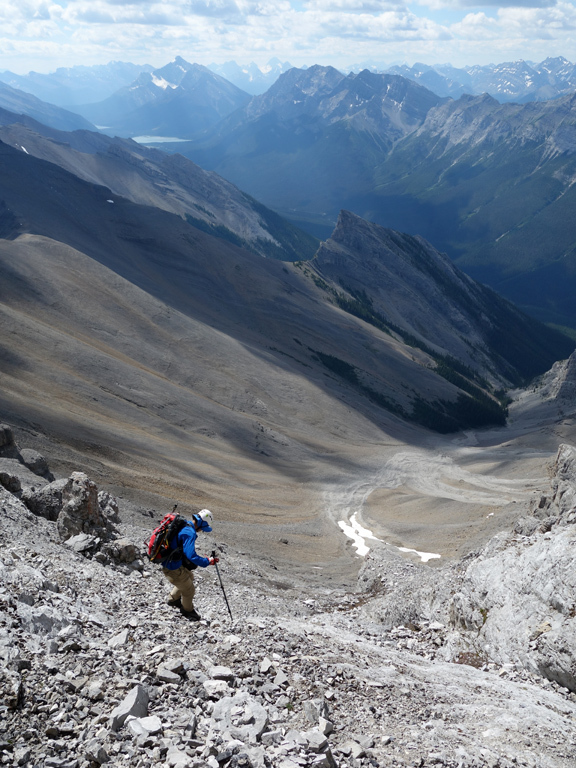 The EEOR is an incredibly easy scramble, bordering on a hike. 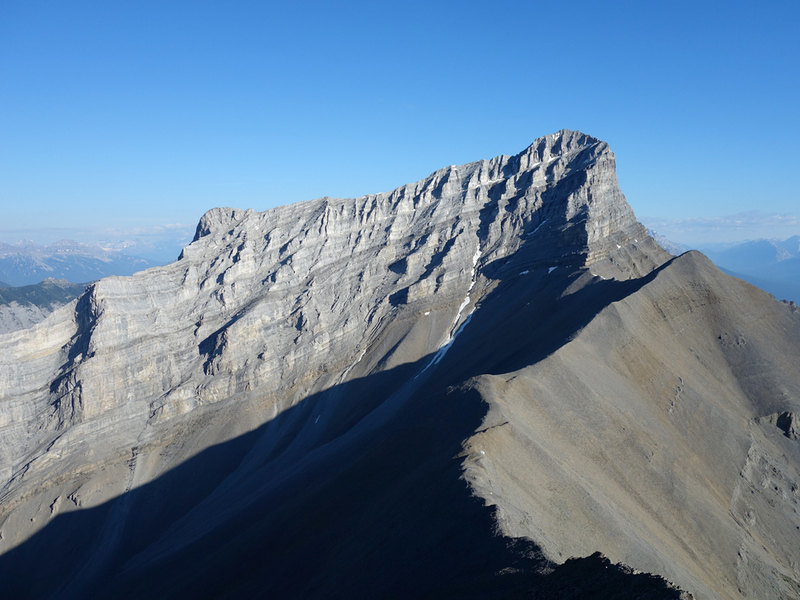 The long traverse from the east end to the base of Rundle's true summit has three difficult scrambling sections, two of which would be considered as cruxes on most other mountains, but should be manageable for an experienced scrambler. 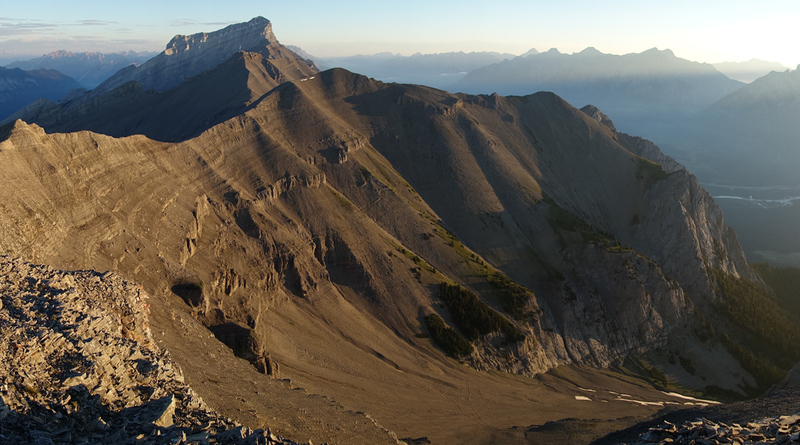 The main summit, however, should not be attempted without sufficient gear to perform two 10m rappels. 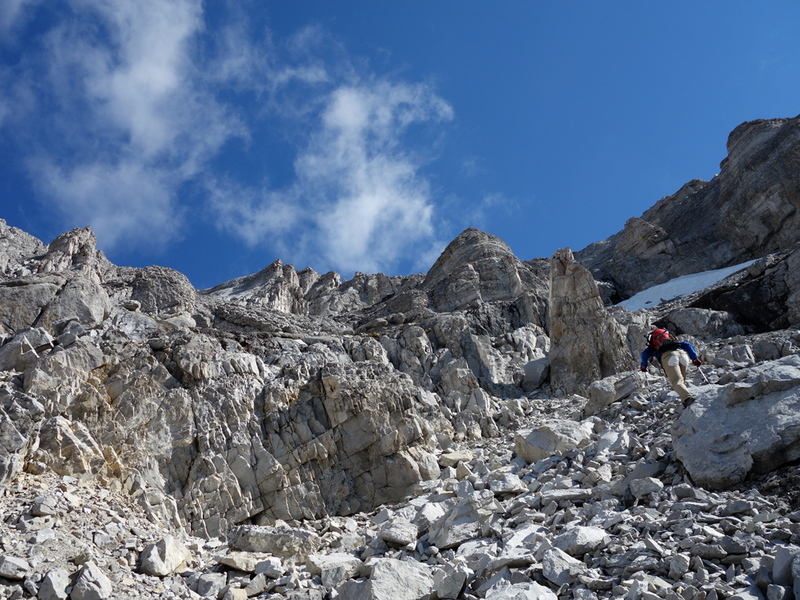 While Steven and I managed it without such gear, this is a climber's scramble that can border on free-soloing at times with one vertical cliff band after another. 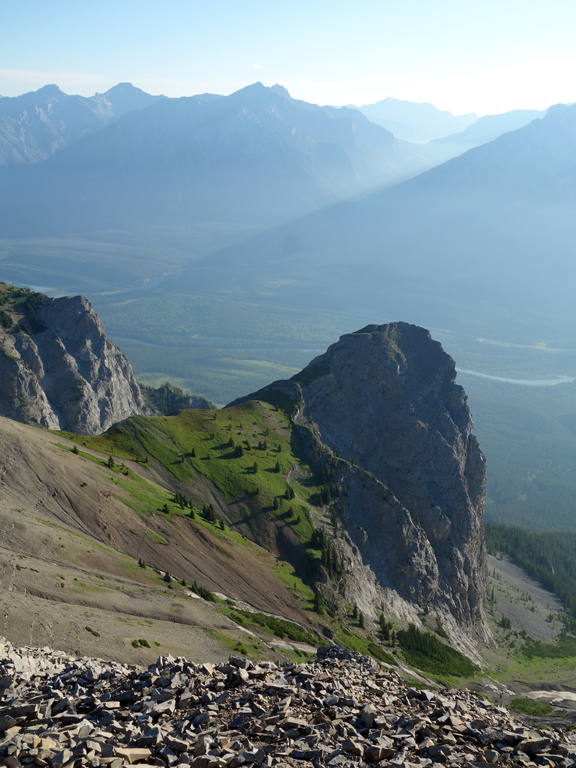 If you're headed up, make sure you have options for getting down. 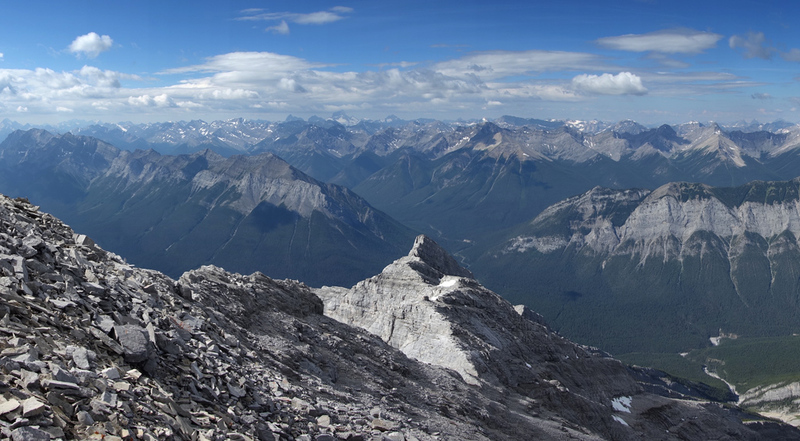 Also, note that the western summit of Mt. 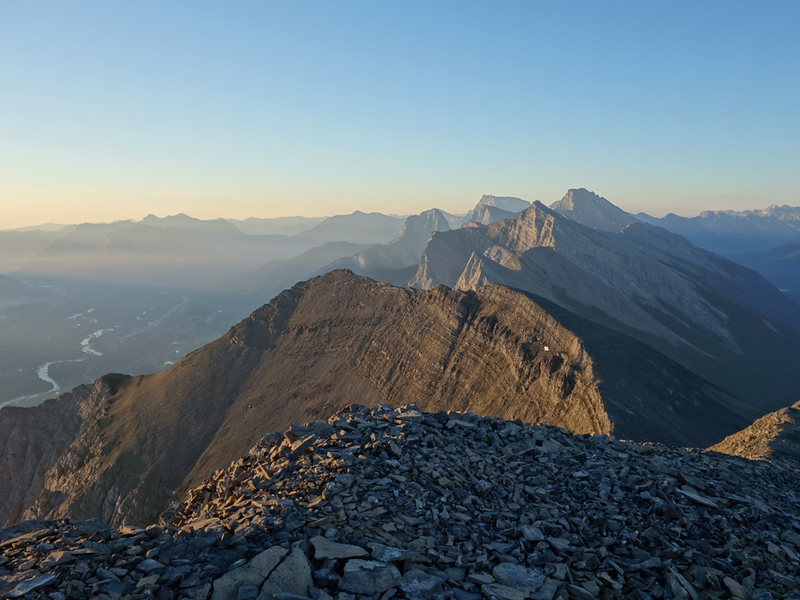 Rundle (also referred to mistakenly as the main summit in Kane's book — it's 60m+ lower) is a completely separate trip that begins from the Town of Banff. 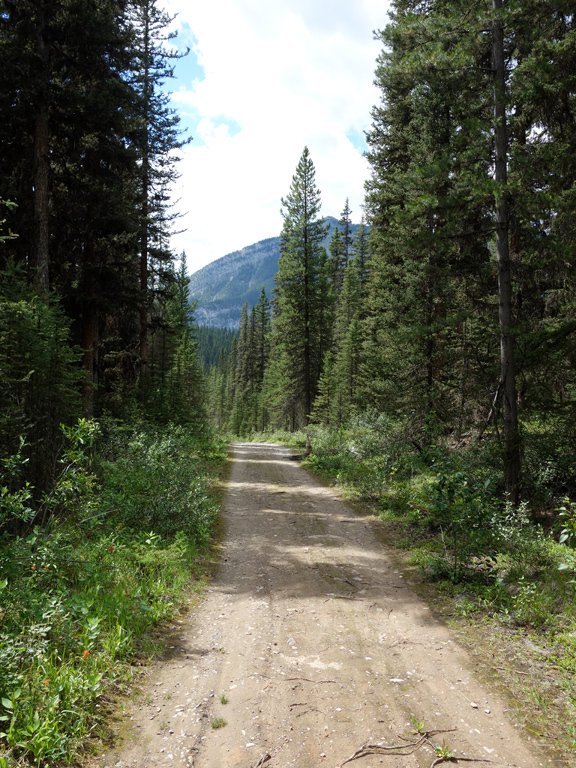 The trailhead for the EEOR can be reached by following the Spray Lakes Road for 8.5km from the Town of Canmore, past the Nordic Centre, and then up a steep climb on a gravel road. 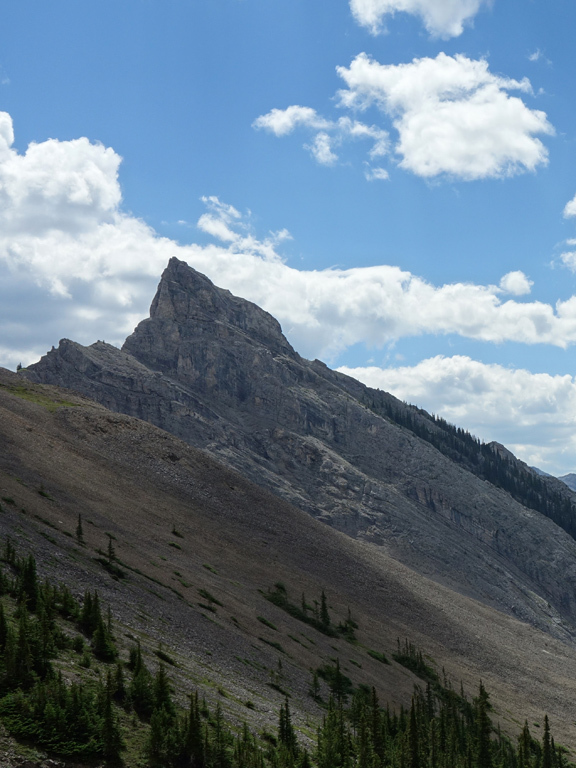 You'll want to park on the left (southeast) side of the road at the far end of Whiteman's Pond (before the road heads downhill to the Goat Creek Day Use Area). A few faint trails lead from the northwest side of the road up into the trees, take one of these and it should lead you the main trail by the time you gain the ridge. 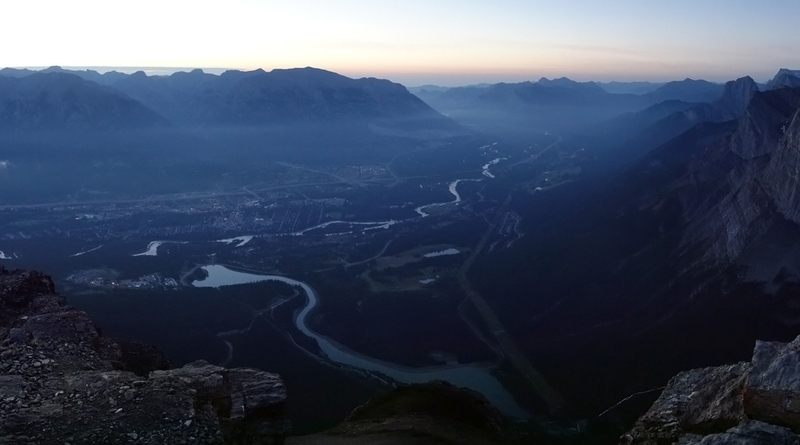 Starting at 3:15 AM in the morning in order to catch the sunrise and avoid the expected heat of the afternoon, Steven and I did the entire ascent of EEOR by headlamp. 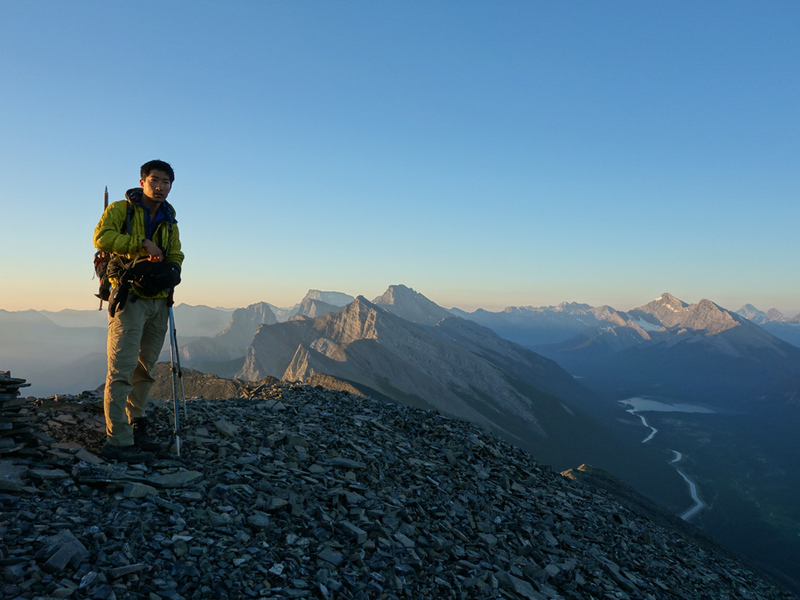 The routefinding was exceptionally easy even with a limited field of view, and, maintaining a steady pace without breaks, we reached the summit in less than two hours. 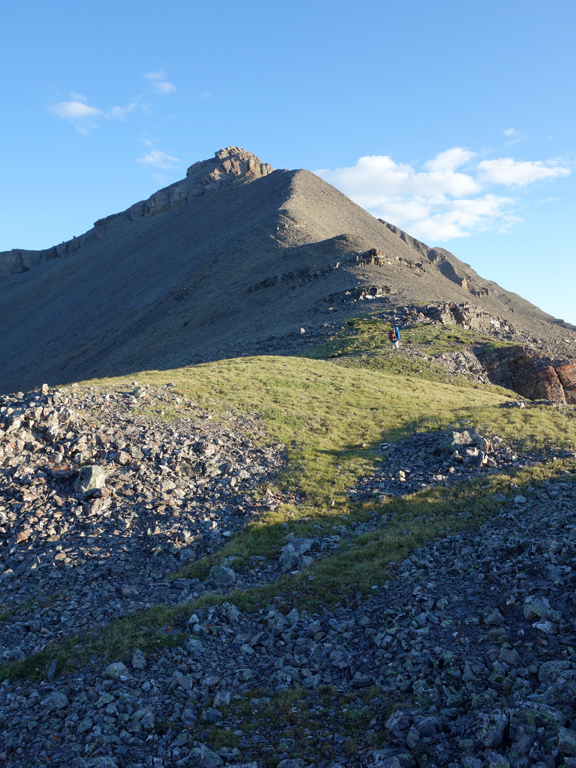 The only other thing to say about the route for EEOR is that you have a choice of two routes once you reach the open scree slopes; head to the climber's right to follow the skyline or head to a gully on the climber's left which climbs between EEOR's two summit high points. 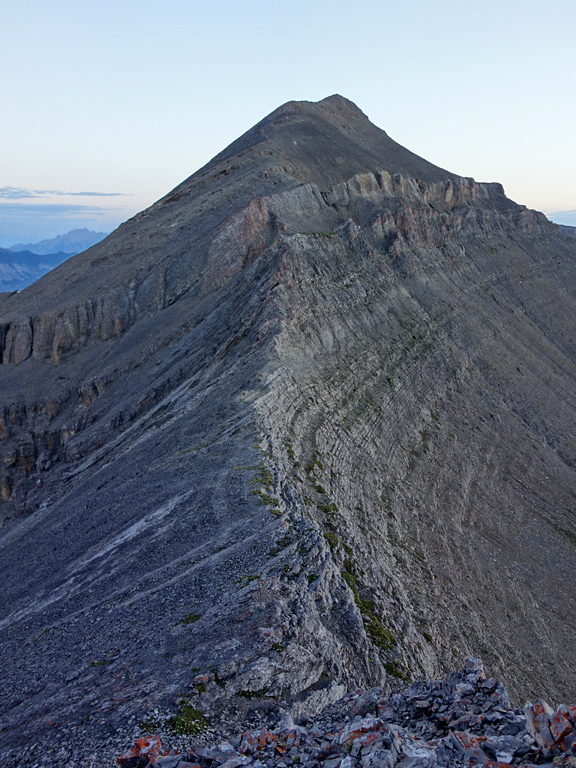 These two lines can be combined to form a loop (I'd suggest going counter-clockwise), with the skyline route requiring some easy, but at times exposed hands-on scrambling. Sidenote: My report follows the peak numbering scheme from Google Maps, but I've since been told that other sources count from the opposite direction. 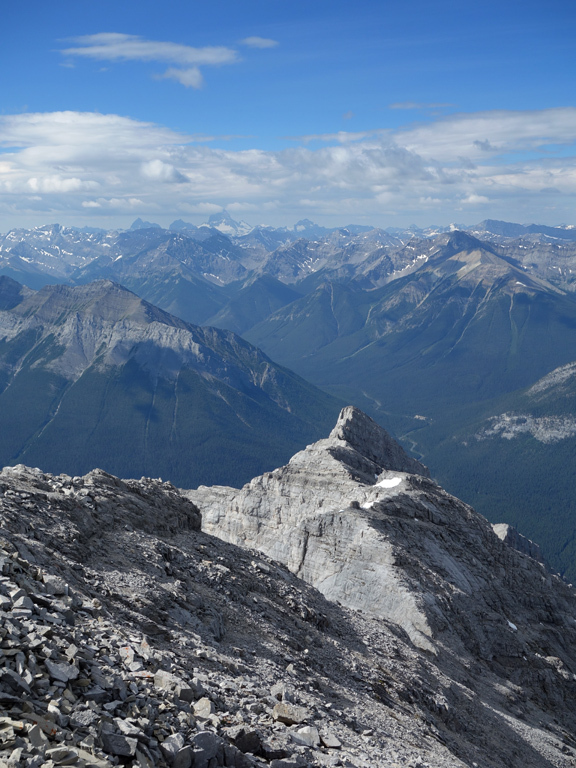 The summit of Rundle 7 (EEOR) marks the beginning of an incredible 6.6km (4.1 mi) ridgewalk to the base of the main summit (Rundle 3). 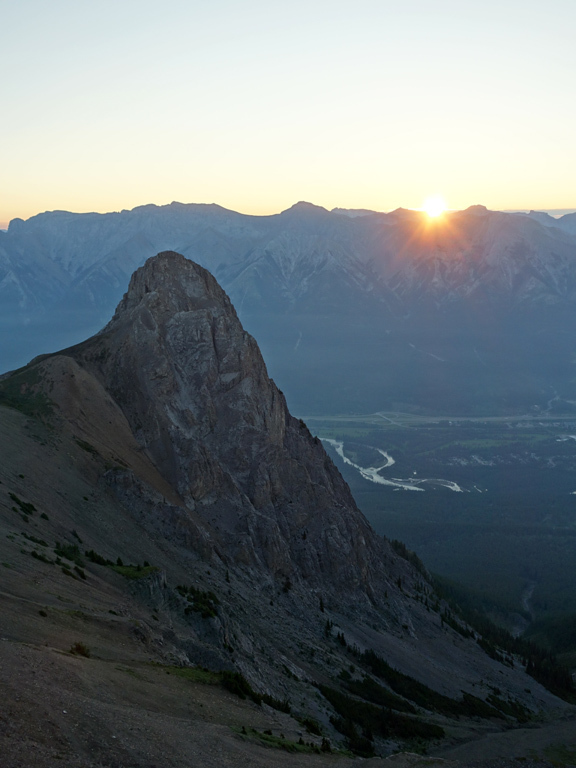 If you're wondering whether you'll be up for this challenge, the ridge connecting Rundle 7 and Rundle 6 will let you know very quickly. 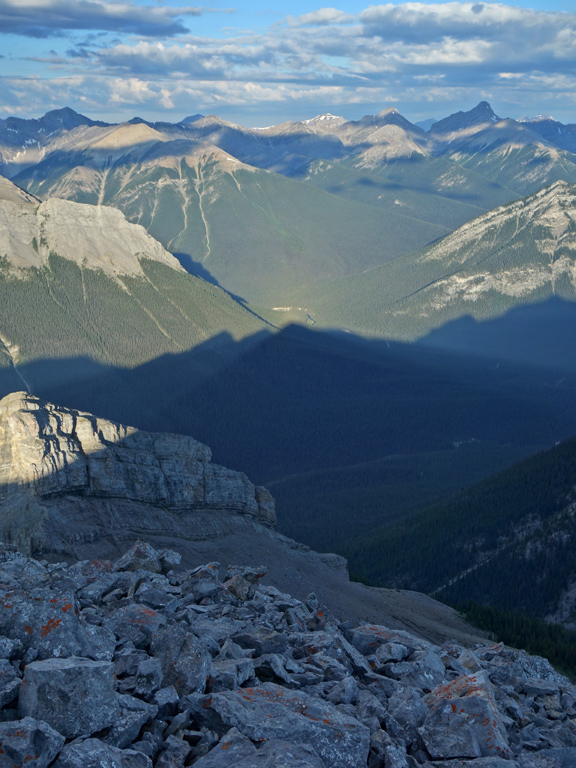 Midway across this narrow and exposed spine, you'll encounter the first crux of the day, a sudden 3m rise in the ridge. 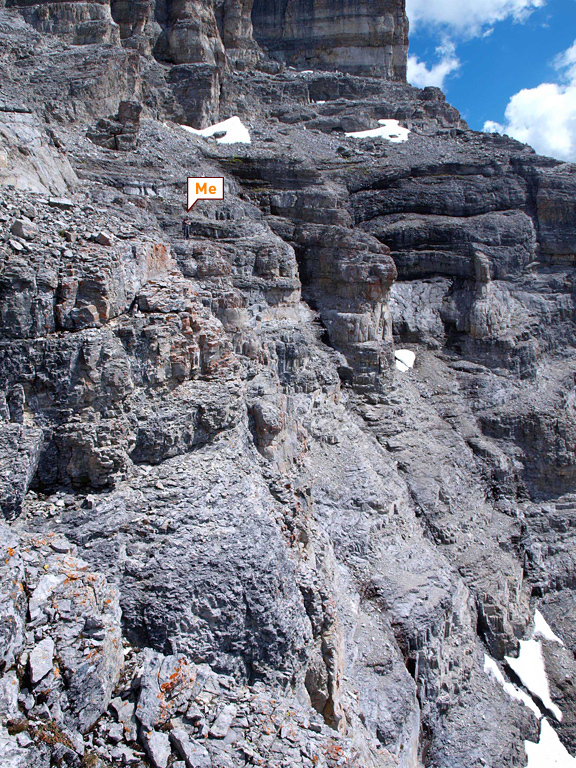 The climb has decent holds available, but a slip here would be very bad. 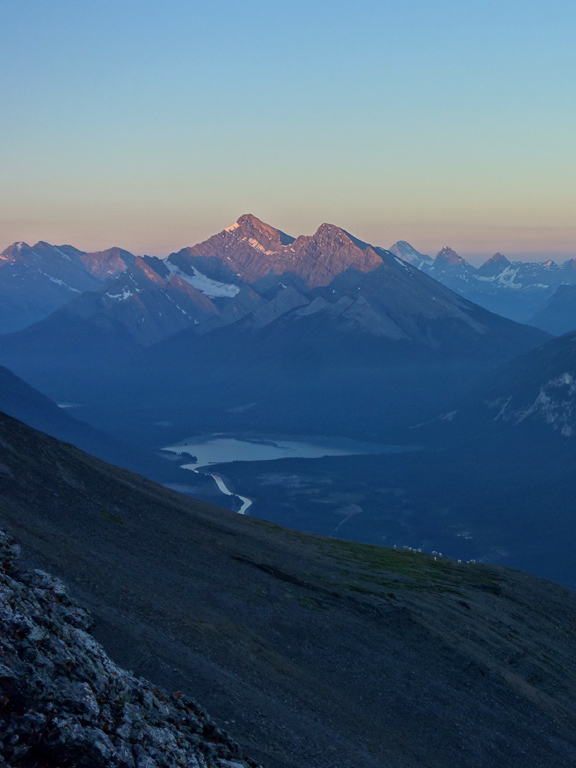 I wasn't quite “feeling this” at 5:30 am in the morning, so while Steven went straight up, I bypassed to the climber's right, made a rather exposed 5-8m traverse, and then climbed up a narrow gully back to the ridge crest. 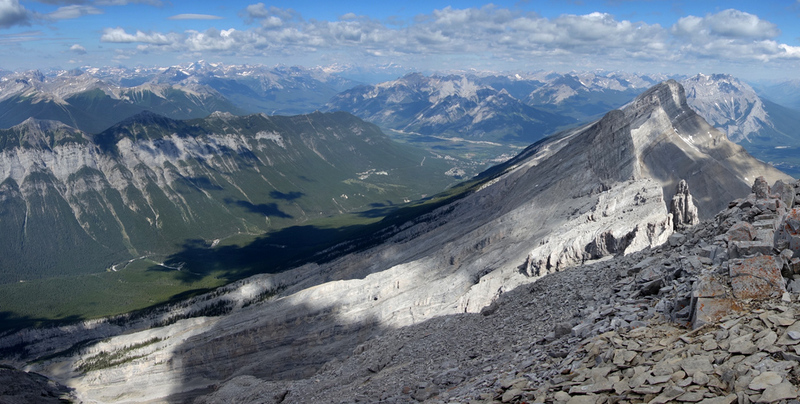 The rest of the ascent to the top of Rundle 6 is straightforward, and the traverse from Rundle 6 to Rundle 5 is an enjoyable hike. 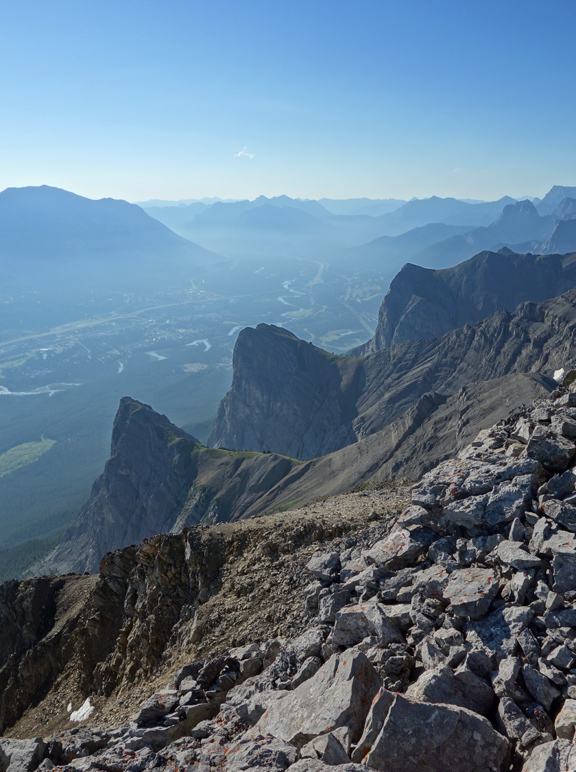 When we neared the elevated summit block of Rundle 5 we noticed two cairns, one on the summit, another further to the climber's left. 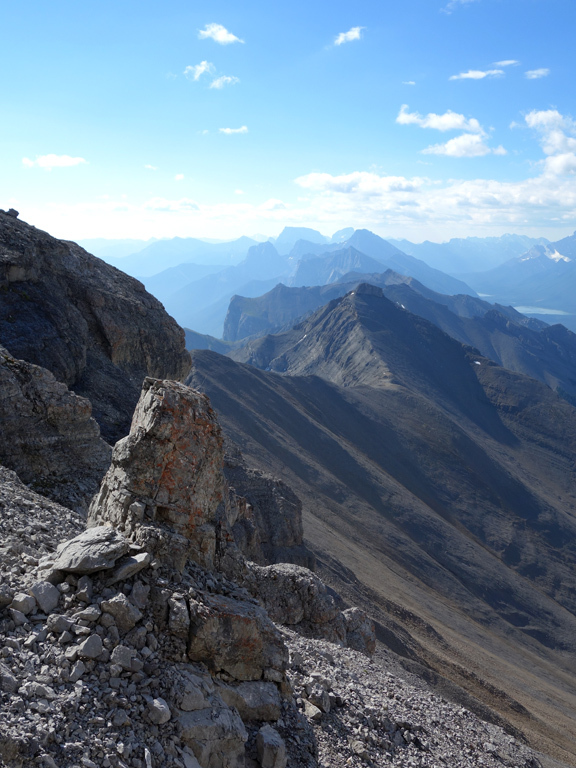 We decided to go for the summit and ran into a fairly nasty notch shortly past the summit cairn. 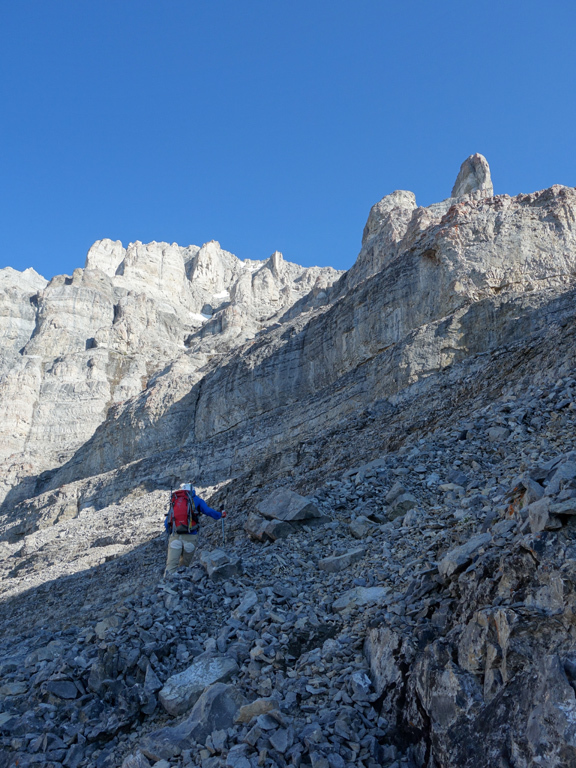 It was easy enough to downclimb into, but the other side was too vertical to even attempt, so we made careful use of a few scree covered ledges to reach the scree bypass the other cairn would have led us to. 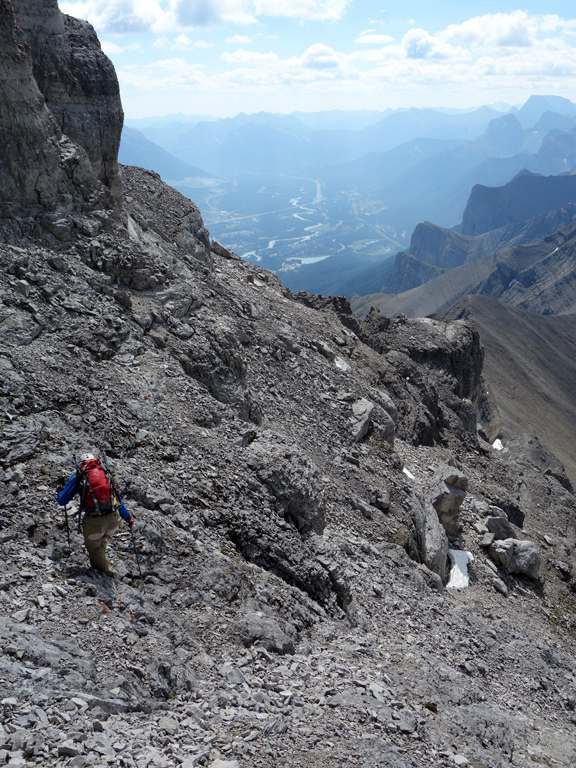 We soon regained the ridge and continued towards Rundle 4, which we bypassed on loose scree slopes to the climber's left, but probably should have just hiked up. 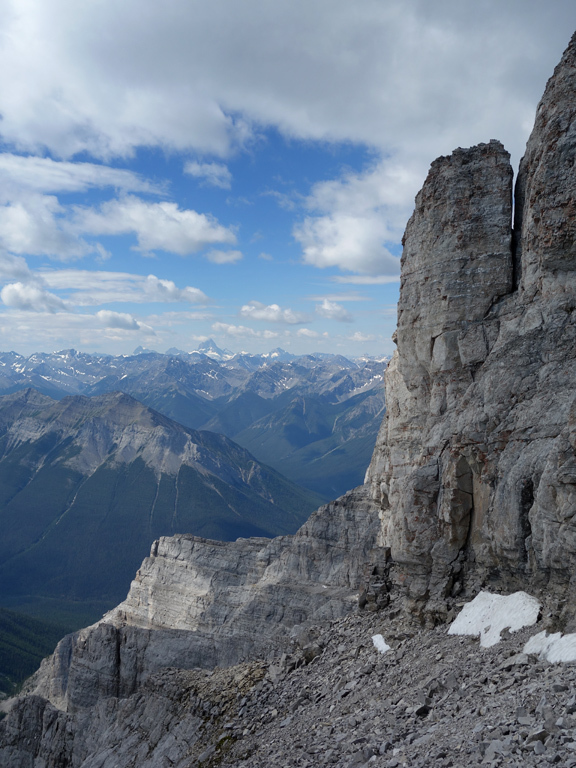 We encountered the main crux of the traverse on the only high point that doesn't have a name, which I'll call “Rundle 3.5”. 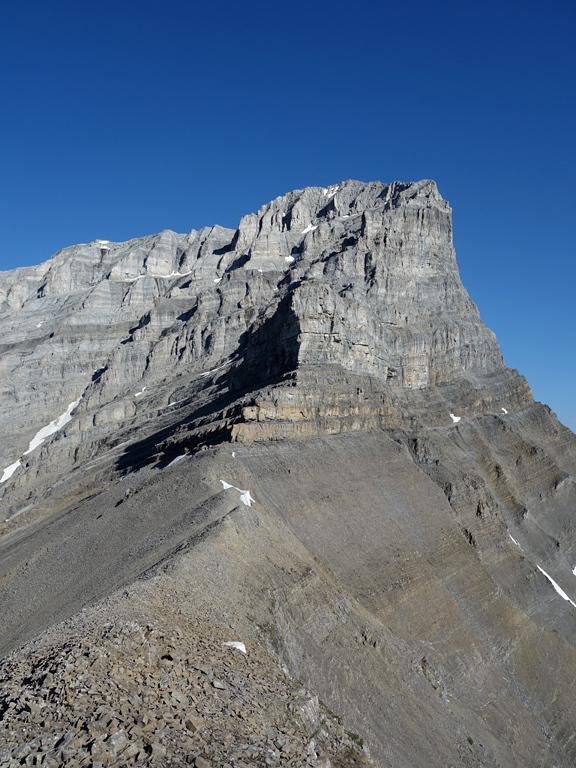 The summit of Rundle 3.5 is easily reached, but its northwest and northeast faces are quite vertical and must be downclimbed to continue. 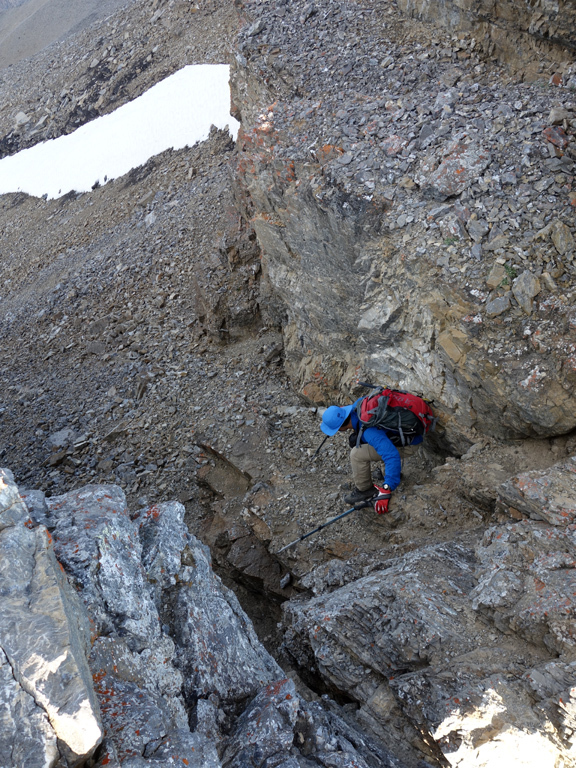 First, follow the obvious northwest gully down several metres (it eventually cliffs out) before heading climber's right towards a ledge with a cairn. 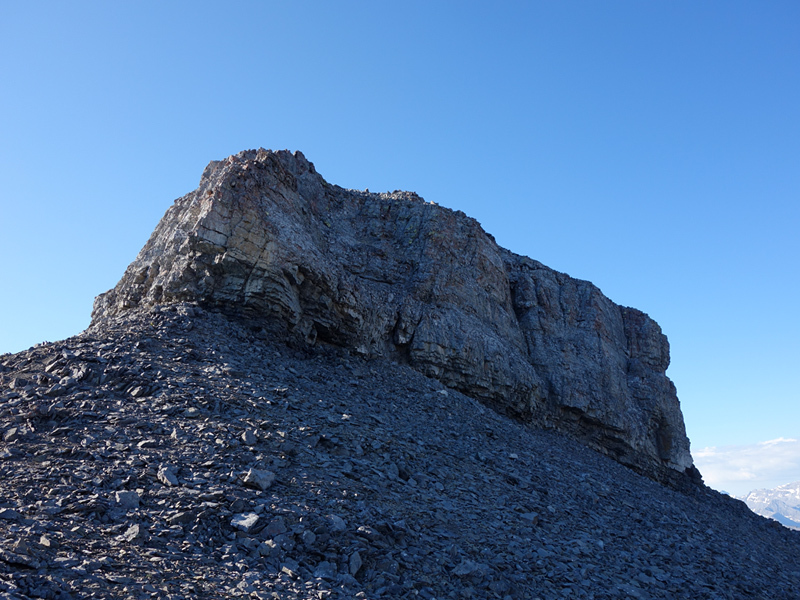 Now on the northeastern face, you need to carefully traverse the exposed terrain for 8-10m until a decent line appears to downclimb the remaining 4m to the scree below. 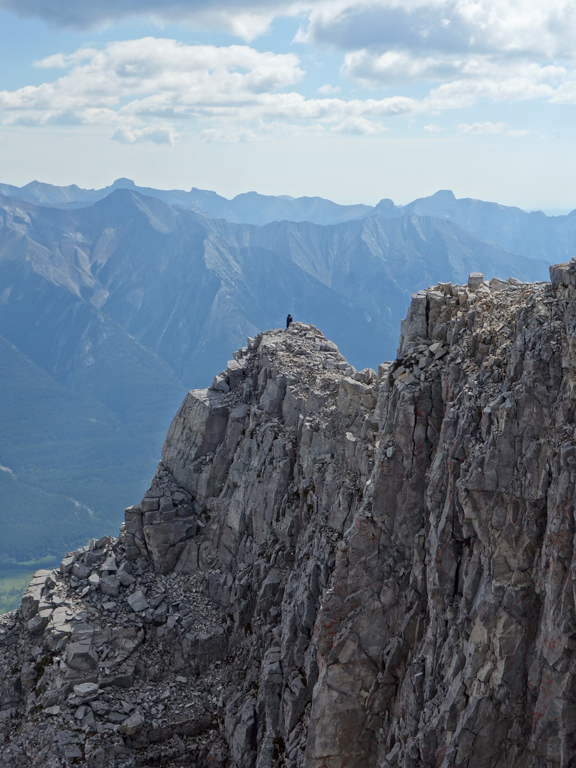 This is the last obstacle of the traverse. 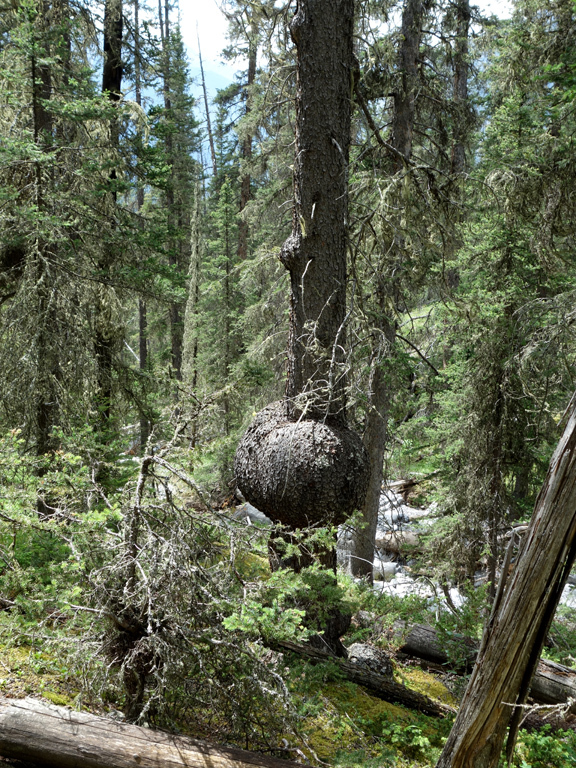 One of the things I noted and liked about the traverse is that there are a lot of viable bailing options. 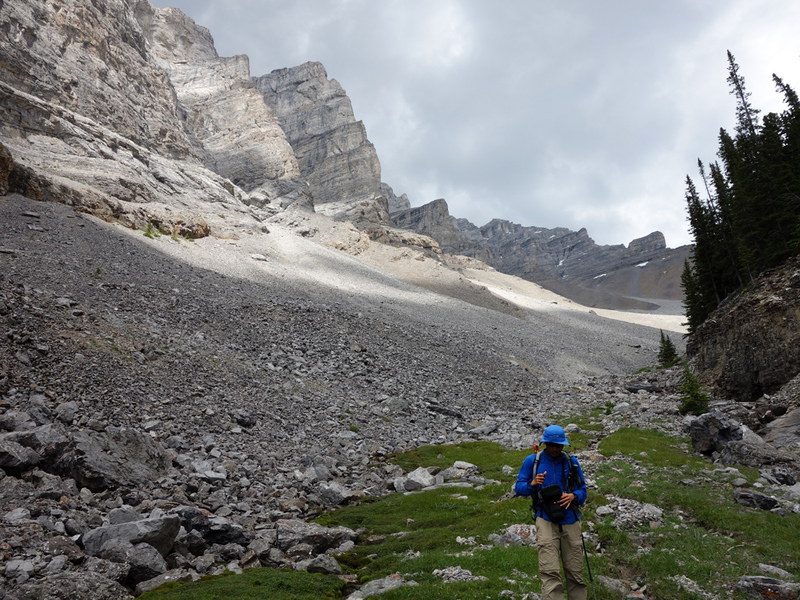 If a storm were to suddenly sweep in while you are midway across the traverse, you could drop down almost any gully and safely make your way to either the Goat Creek Trail (southwest) or the many trails at the Nordic Centre (northeast). 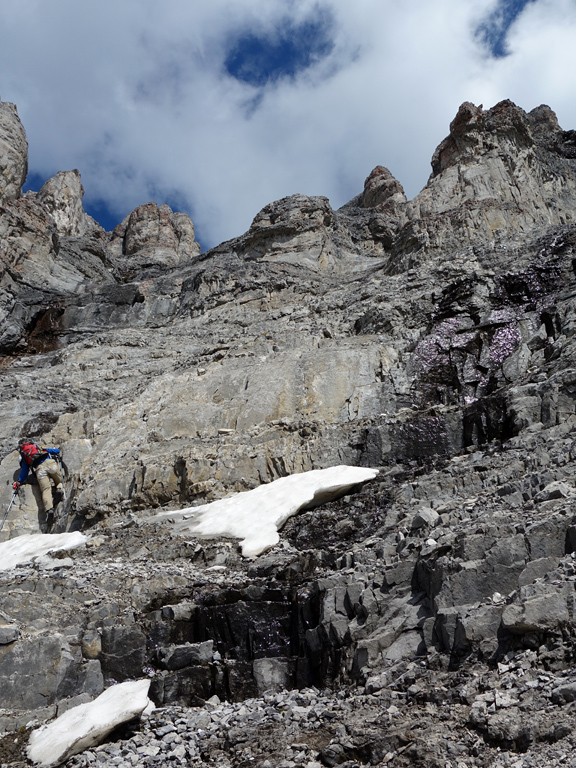 An assault on the main summit of Mt. 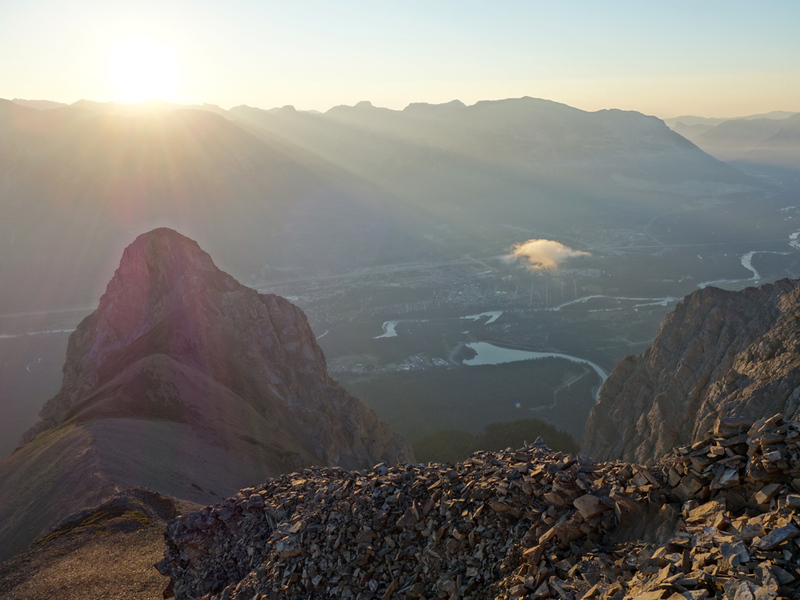 Rundle is not for the faint of heart. 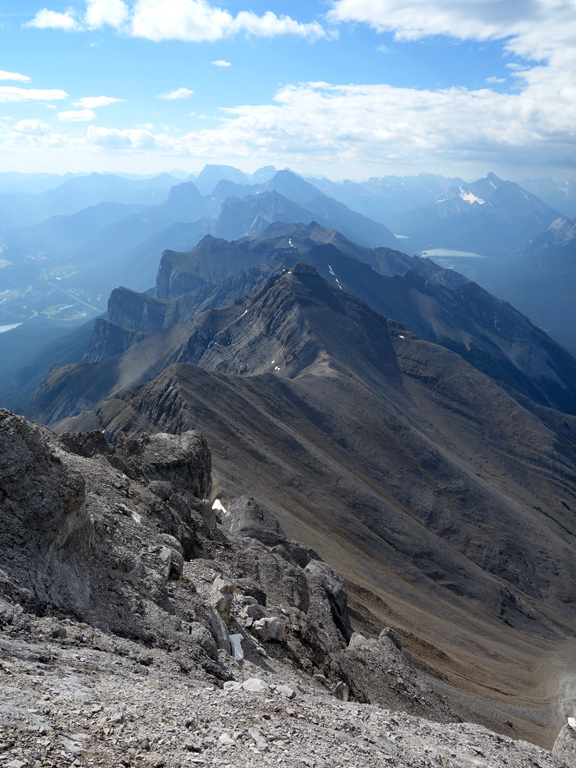 From the vantage point of the traverse, the main summit is an "L" shape where the lower section of the letterform is pointing directly towards you. 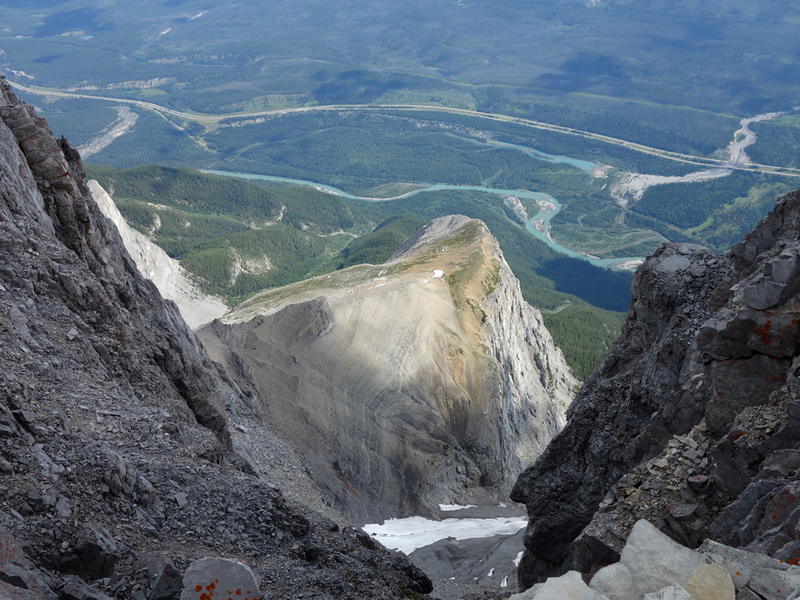 The ascent route follows the main drainage right where the two lines of that L intersect. 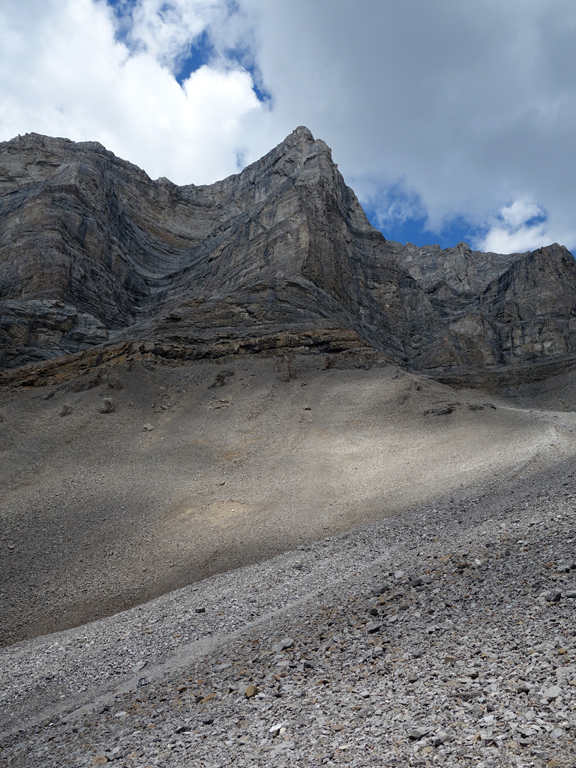 The route looked impossible from Rundle 7, and I kept telling myself that it would probably look better once we got closer. It didn't. The 6-8m cliff band directly above Steven in image 31 can be gained by following a large crack that's located roughly above his head. You can see this crack in image 61. 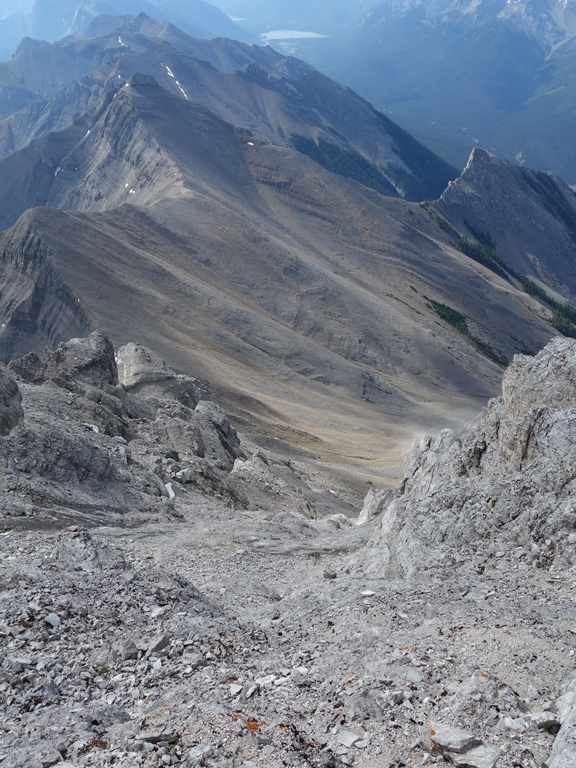 The lower crux is the most difficult section of the climb. 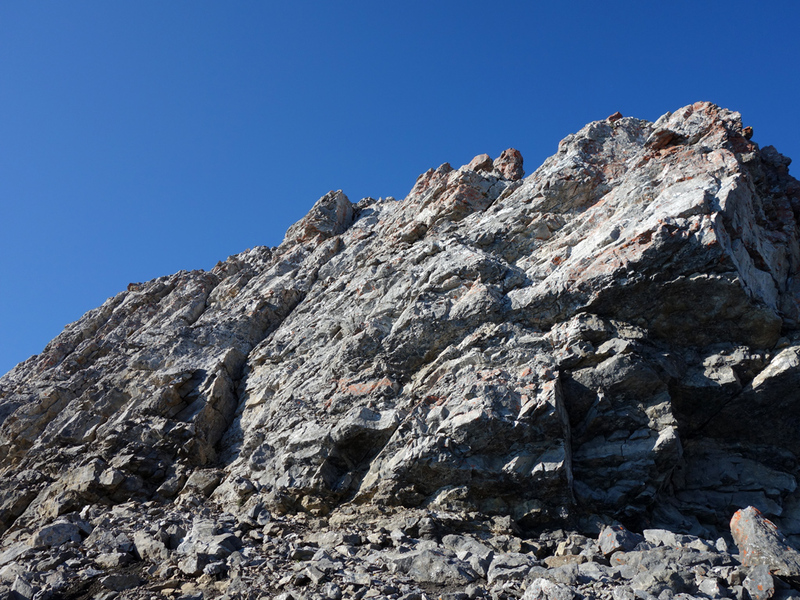 Shown in image 59 this section forces you to traverse diagonally across a shallow and highly exposed rock shelf from the climber's left to right, from where a few vertical steps lead to one last awkward move to gain the safety of the ledge above. 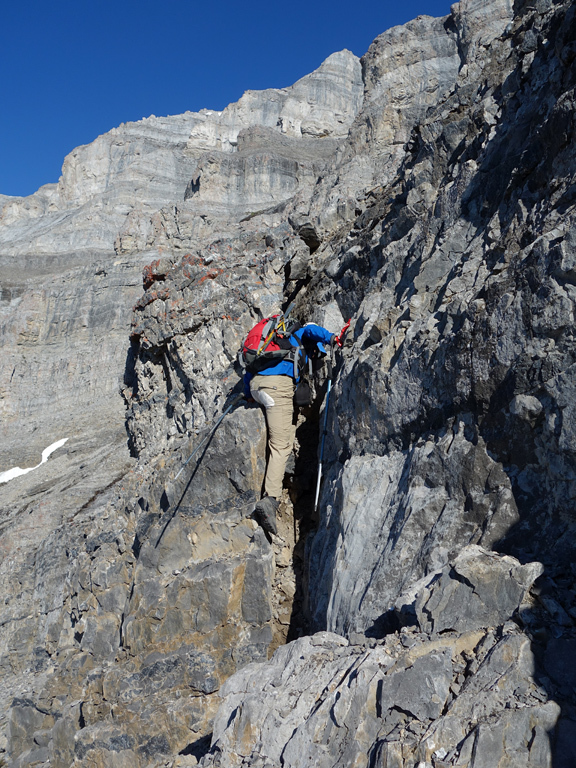 The ledge offers no real handholds, and I must have tried a dozen different hand positions before hoisting myself up. 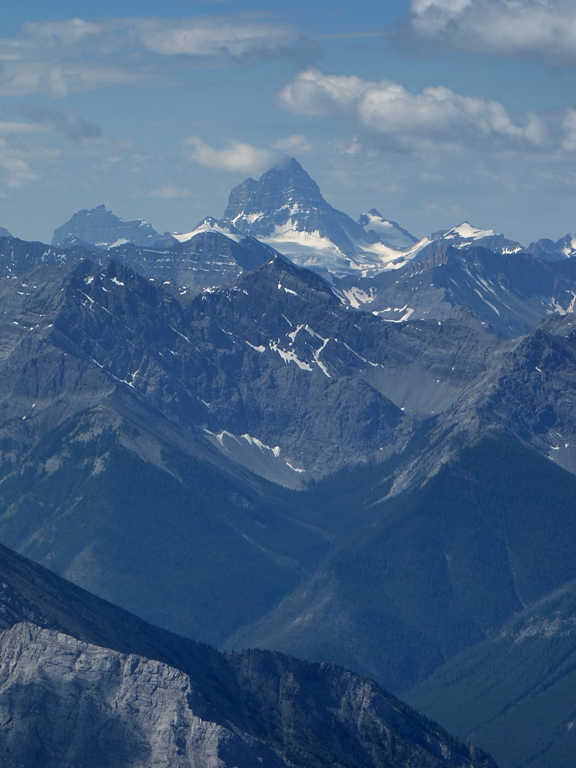 As shown from a slightly lower location in image 60, or off to the skiers right in image 58, there's little to slow or stop you if you make a mistake. 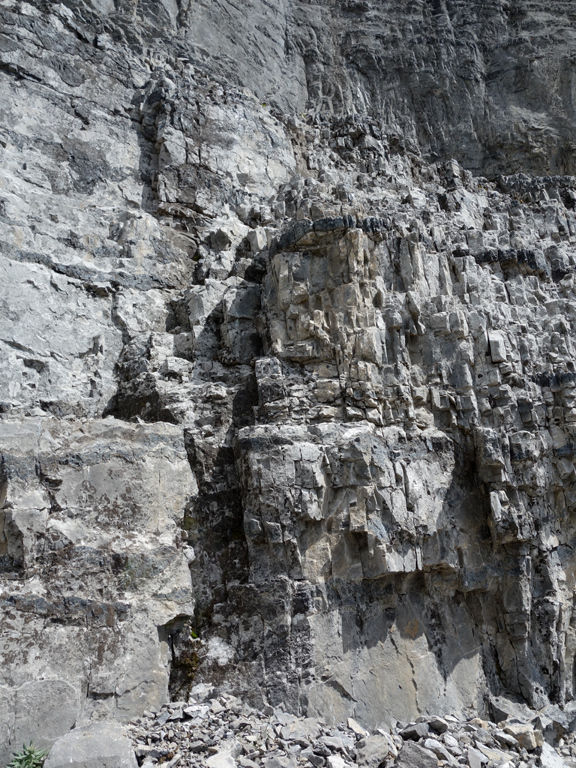 There was a rappel station setup around a large rock directly above this section. 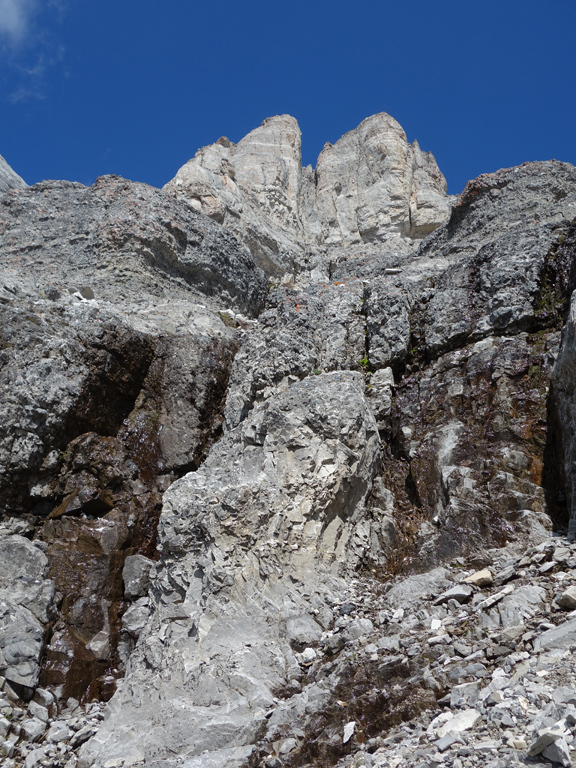 The upper crux involves ascending a short waterfall as shown in image 55. 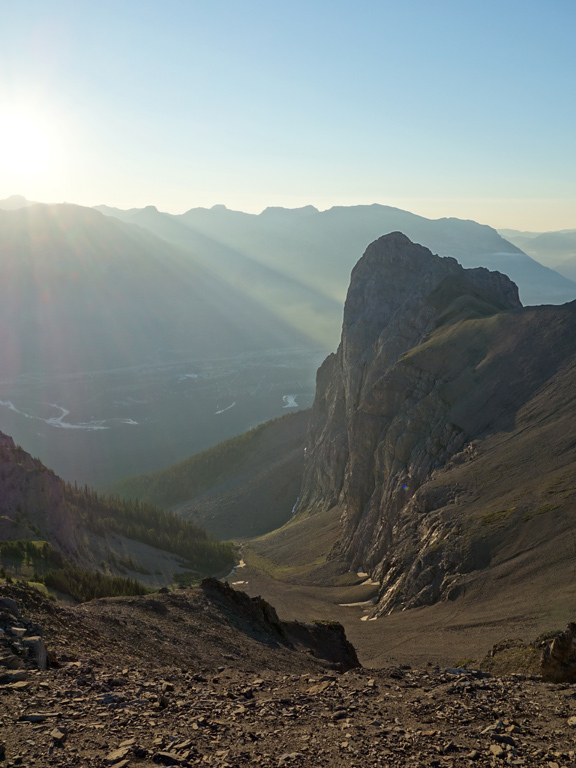 Things are easier once you reach the mid-level ledge, which can be reached by going straight up the centre (requires a long reach for adequate holds) or climbing up the waterfall directly to its right, which has better and more accessible holds, but which is also wet. 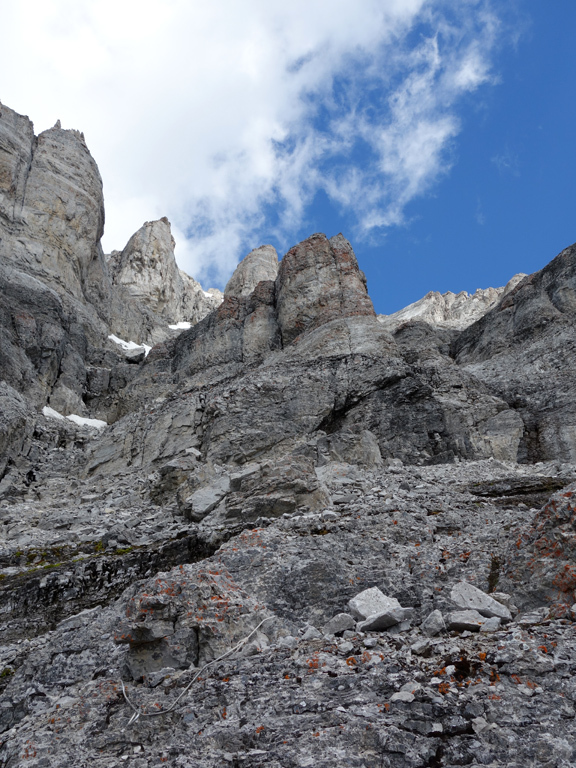 You'll find a bolted rappel station on a rocky outcrop above this crux to the climber's right. The bolt looked slightly rusty. 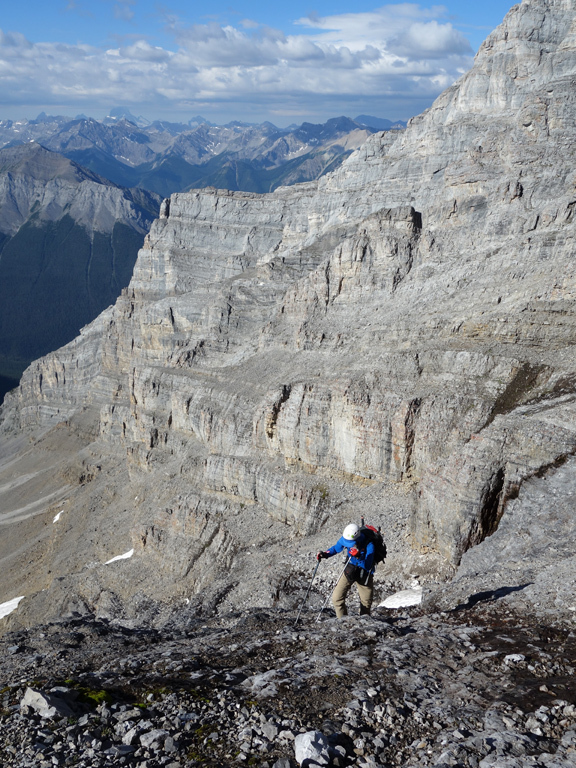 When you're not making your way up cliffs, you'll be on very steep terrain with plenty of loose rock and scree. 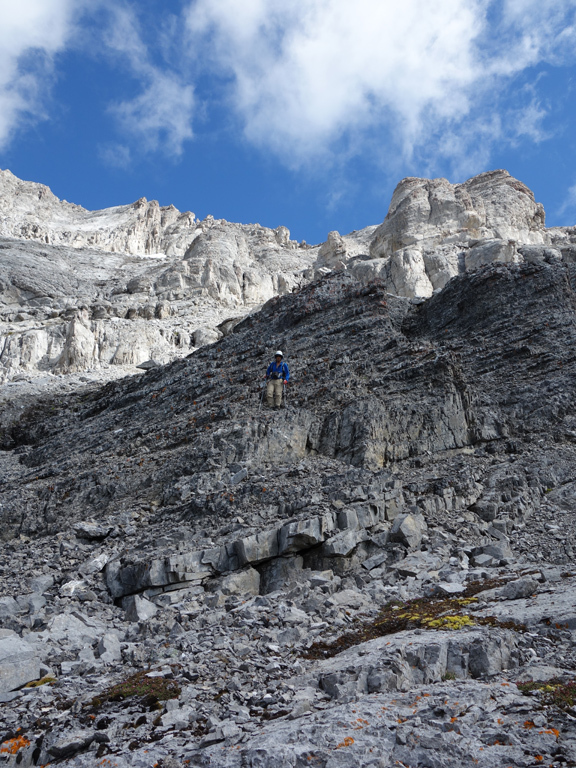 Steven and I either stayed close together to mitigate the rockfall risk, or took turns “clearing” sections. 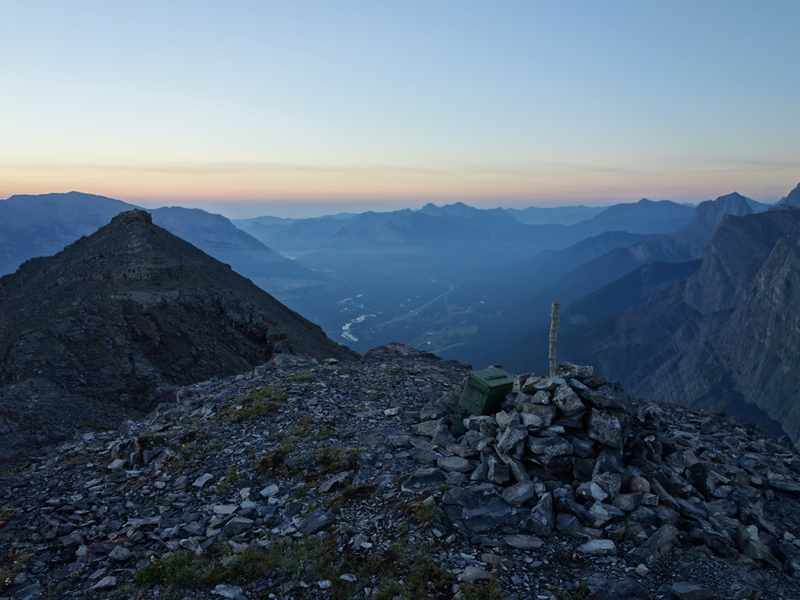 Once we cleared the drainage the last few steps to the summit were relatively easy, leading to a small summit cairn with no register. 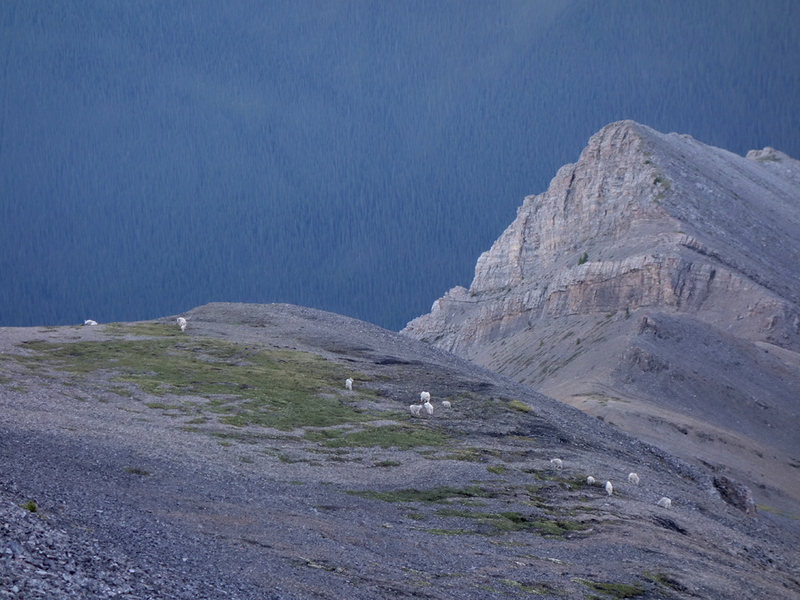 The downclimb was a slow and very careful affair. 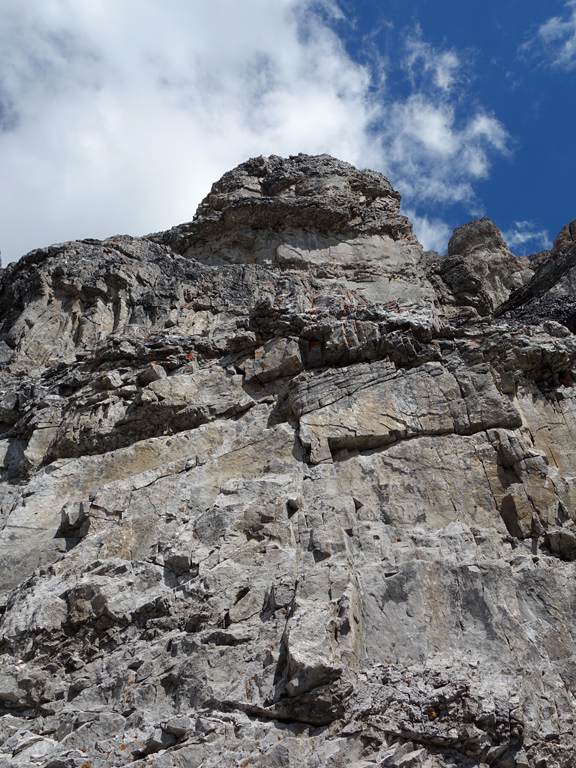 We spent a long time trying to find an alternative to downclimbing the lower crux, and couldn't find one. 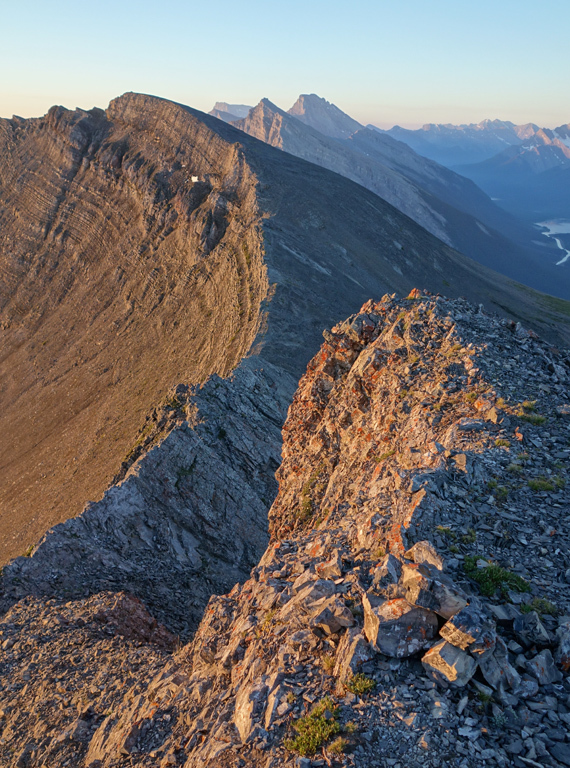 If we had rappelling gear with us, we would have used it here for sure. 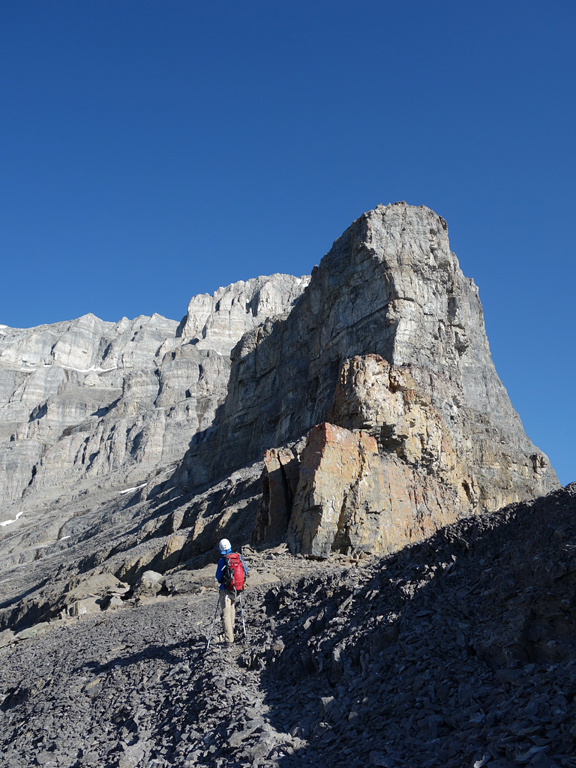 To say that I was relieved once we cleared the last cliff band and started down the (unfortunately solid) scree slopes would be an understatement. 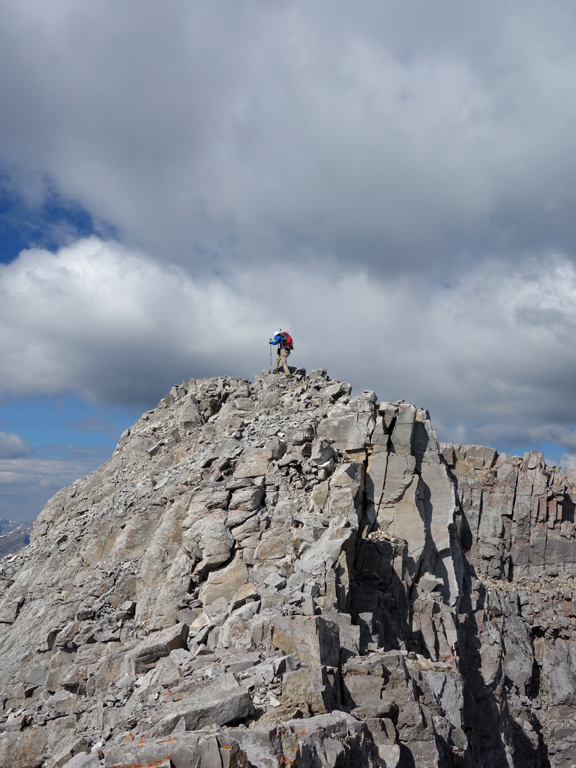 The main summit of Mt. 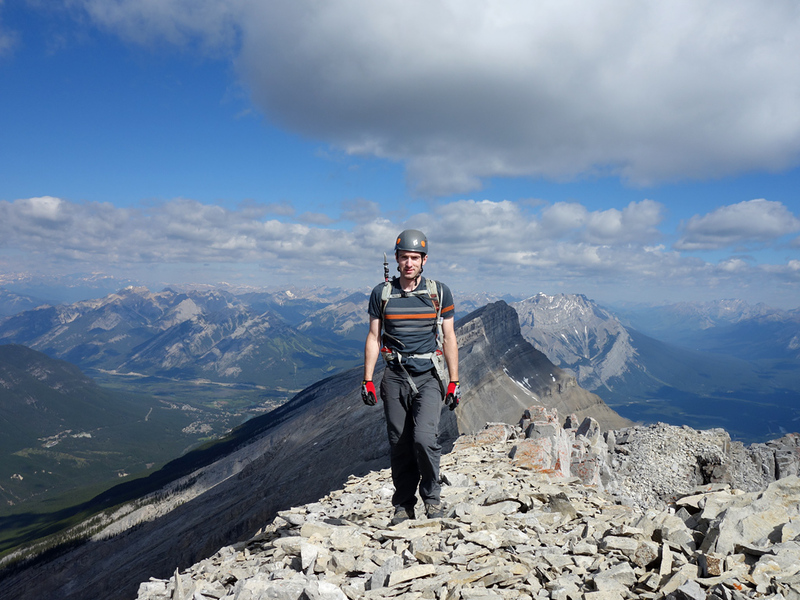 Rundle is easily the most difficult trip I've done to date, while Steven felt it was his second hardest after Mt. 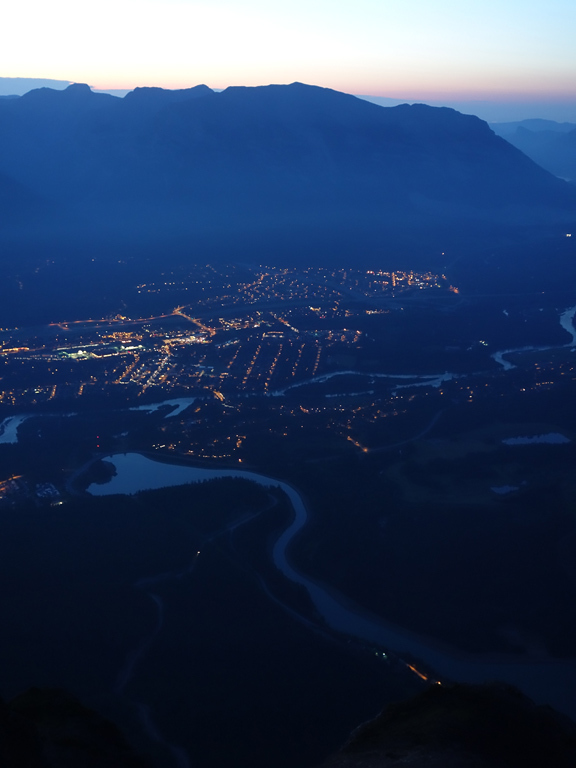 Northover. 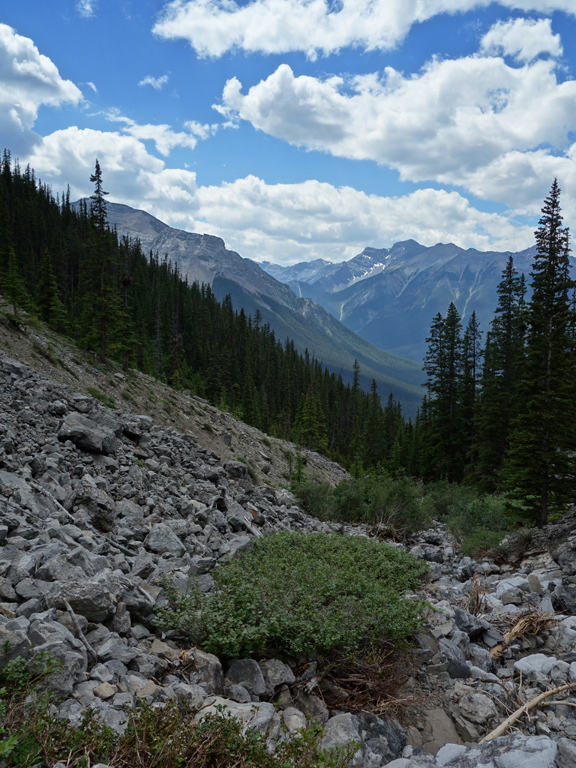 Sidenote: If you're in a rush, biking in along the Goat Creek Trail and then ascending our descent creek would save at least 2-3 hours from the trip. 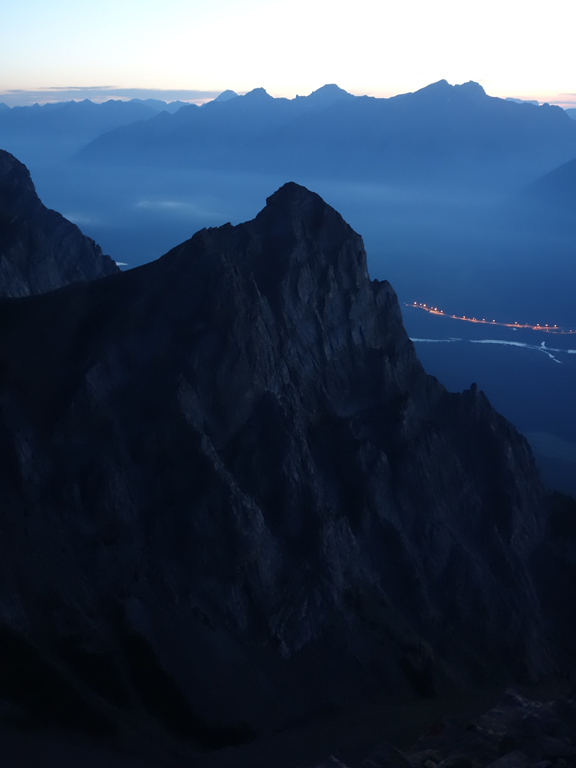 However, it would make for a viewless and highly tedious ascent. 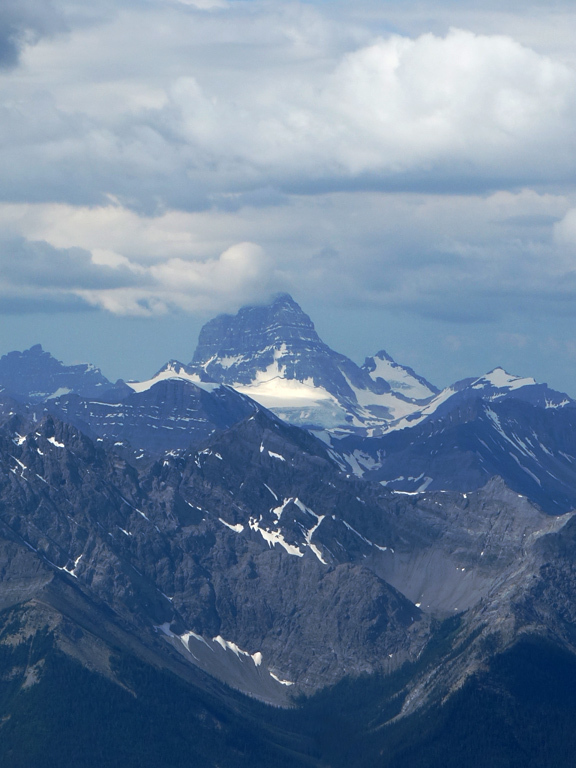 Summit: 2,930 m / 9,613ft.